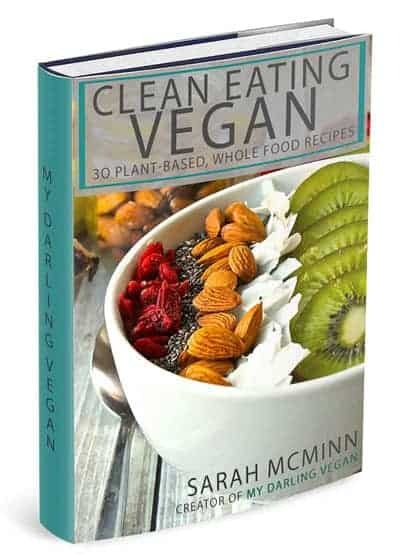 Start your day off with this delicious vegan and gluten-free baked oatmeal. 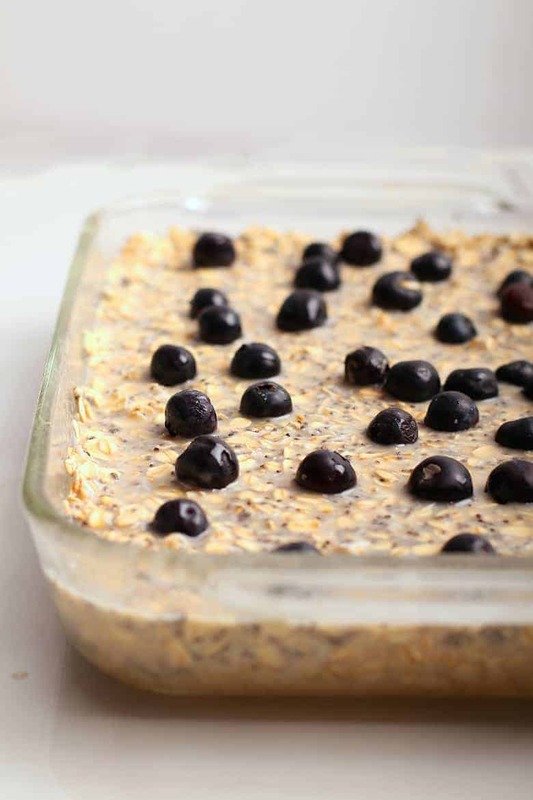 Made with bananas, blueberries, and coconut for a sweet and creamy heart-healthy breakfast. Just 10 minutes of prep time! On most days my typical breakfast is a veggie-packed tofu scramble. In the summer, I lean more towards fruit smoothies and acai bowls. But every once in a while, I’ll get a sweet tooth and start craving baked oatmeal in the morning. 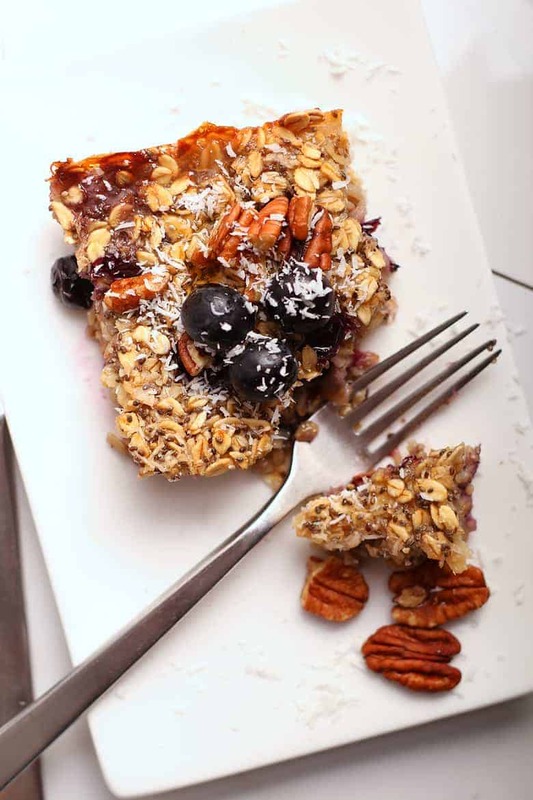 And this Coconut and Blueberry Vegan Baked Oatmeal is my go-to. 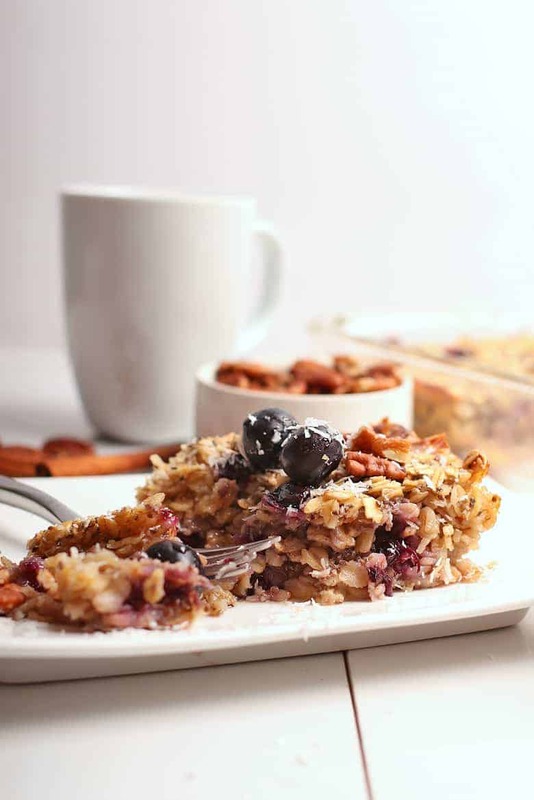 It is like an oatmeal casserole filled with fruit and packed with wholesome, heart-healthy ingredients that will not only satisfying the sweet tooth but leaves you feeling fueled all morning long. 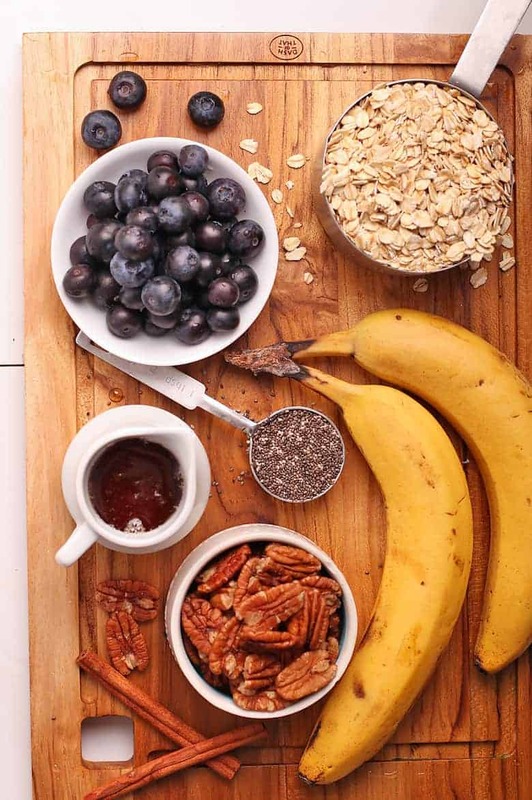 It’s the perfect breakfast when you’re craving something sweet during the 30-day cleanse. I’m a huge fan of oats. I love them in granola bars, oatmeal scones, savory oats, and of course, the WORLD’s BEST Oatmeal Cookies. But, truth be told, I’m not a huge fan of oatmeal. I don’t enjoy the porridge-like consistency of most oatmeals and I rarely opt for something sweet in the morning. And that is where BAKED oatmeal comes in. Rather than cooked on the stovetop, baked oatmeal is made in the oven. It is made with similar ingredients – a combination of oats, fruit, nuts, and a sweetener (I choose maple syrup). Traditional Baked Oatmeal Casserole is made by combining the oats with an egg-based custard to give it a bread pudding texture that helps bind the oatmeal together. The end result: a casserole that is somewhere between the texture of bread pudding and an oatmeal bar that allows the oats to keep their shape and texture without getting soft and mushy. Now that’s my kind of oatmeal. What are the best oats to use for baked oatmeal casserole? For baked oatmeal, I recommend using extra thick cut oats. You’re looking for oats that will keep their shape during a slow bake so that you can have that perfect oat texture. Because this bakes for 45 minutes, quick oats won’t stand up again the liquids in the oven and will become mushy. Old fashioned oats will work, although won’t hold their texture quite as well as extra-thick cut oats. And since we are on the 30-day cleanse, make sure to look for gluten-free oats. This is the brand that I recommend. Wait, aren’t all oats gluten free? Unfortunately not. Most oats are rolled flour during the process or are cross-contaminated by sharing the same equipment as wheat products. If you are strictly gluten-free, make sure to find the oats that are labeled as such. Good news! Vegan baked oatmeal is super simple to make. It’s a matter of combining your dry ingredients – that’s your oats, spices, nuts, and baking powder – in one bowl and your wet ingredients in a separate bowl. Unlike stovetop oatmeal, traditionally baked oatmeal is made by pouring custard over the dry ingredients. And, as you know, at the base of all (non-vegan) custards is eggs. Because baked oatmeal relies on custard to help hold the casserole together, we need to find a good egg replacer. And for this recipe, we’ve got several different options. I like the chia egg because it gives the baked oatmeal a little crunch while boosting its healthy benefits by adding one of the best superfoods available. For similar results, we could make our custard with a flax egg. The other egg replacer I recommend is chickpea flour. Chickpea flour provides a texture much more similar to traditional baked oatmeal without adding the crunch of chia or flax seeds. To substitute chickpea flour, combine 2 tablespoons of chickpea flour with 6 tablespoons of warm water mixing it until it is thick and homogenous. Pour the chickpea eggs into the rest of the wet ingredients, omitting the chia seeds, and follow the rest of the recipe as it. Do remember, chickpea flour does have a strong flavor when unbaked so I don’t recommend trying the casserole before it’s out of the oven. Now with our custard made, we are going to add it to our dry ingredients, mixing it until all the oats are hydrated. Add your favorite mix-ins (see variations below) and bake for 40-45 minutes until it starts to pull away from the edges and is mostly firm with just a slight wobble. That’s it! A 10-minute prep, 30-day cleanse worthy, vegan breakfast. Among the things I love about baked oatmeal is there are so many flavor combinations. In regards to this recipe, feel free to swap out any berry for the blueberries. If you don’t like coconut, you can also omit the shredded coconut and swap out the coconut milk for non-dairy milk of choice. Easy peasy! Peaches & Berries – Swap out bananas for peaches. Use berries of choice and omit the coconut. Chocolate Raspberry – Add 1/4 cup cocoa powder to the dry ingredients and an extra 2 tablespoons of maple syrup to the wet ingredients. Swap blueberries for raspberries. Banana & Chocolate Chip: Omit the berries and coconut. Fold in chocolate chips before baking. Banana Ginger – Add 1/2″ fresh ginger, minced or grated into the wet ingredients. Omit the coconut and berries. When the edges are golden brown, your oatmeal is done. There should be a slight wiggle to the oatmeal. Remove it from the oven and let the oatmeal cool 10 minutes before slicing up and serving. 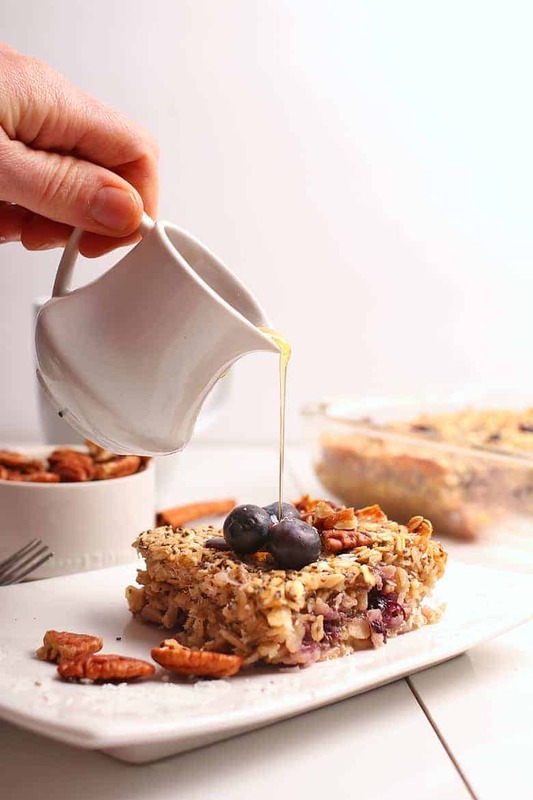 To serve, top baked oatmeal with fresh berries, nuts, and maple syrup. Enjoy as a stand along breakfast or part of a bigger brunch with a tofu scramble and a Chai Tea Latte. If you have leftovers, tightly wrap the oatmeal and store in the refrigerator for up to 2 days. To serve, gently reheat the oatmeal in the oven or microwave. Now, let’s check out the recipe card below. Place the sliced bananas on the bottom of the dish. Top with 1/2 cup of blueberries (or berries of choice) and set aside. In a small bowl, combine the oats, coconut, baking powder, salt, and spices. In a separate bowl, whisk together the coconut milk, maple syrup, vanilla extract, and chia seeds. 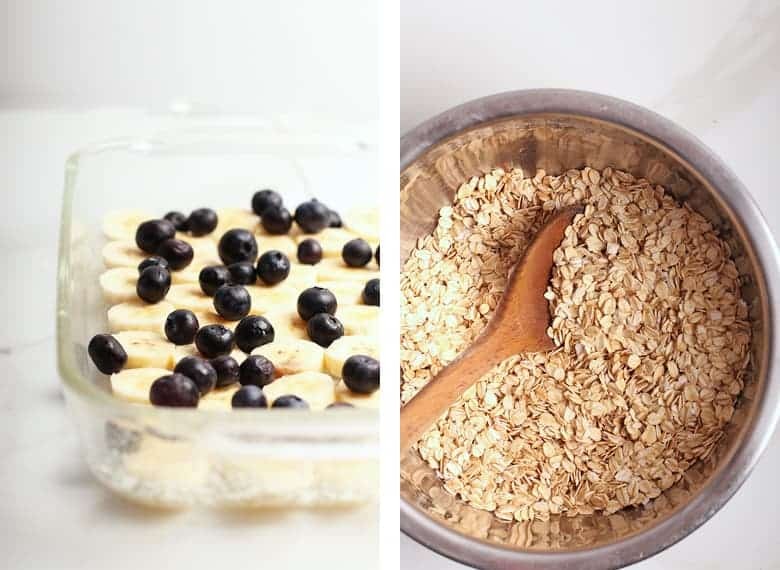 Evenly cover the bananas and blueberries with the oatmeal mixture. Slowly pour the wet ingredients over the oats so that the oats are evenly saturated. You may need to press down on the oats with your hands to fully saturate them. Bake for 40-45 minutes until top is golden brown and oatmeal is baked all the way through. There should be a slight wiggle to the oatmeal. Remove from oven and let cool 10 minutes before slicing. Serve with fresh berries, maple syrup, coconut, and pecans. Don't like coconut? You can omit the shredded coconut and swap out soy or cashew milk for the coconut milk. Two flax eggs can be used in place of the chia seeds. Peaches & Berries - Swap out bananas for peaches. Use berries of choice and omit the coconut. Chocolate Raspberry - Add 1/4 cup cocoa powder to the dry ingredients and an extra 2 tablespoons of maple syrup to the wet ingredients. Swap blueberries for raspberries. Banana Ginger - Add 1/2" fresh ginger, minced or grated into the wet ingredients. Omit the coconut and berries. I made this today, and used peaches instead of blueberries. It is delicious and quick! 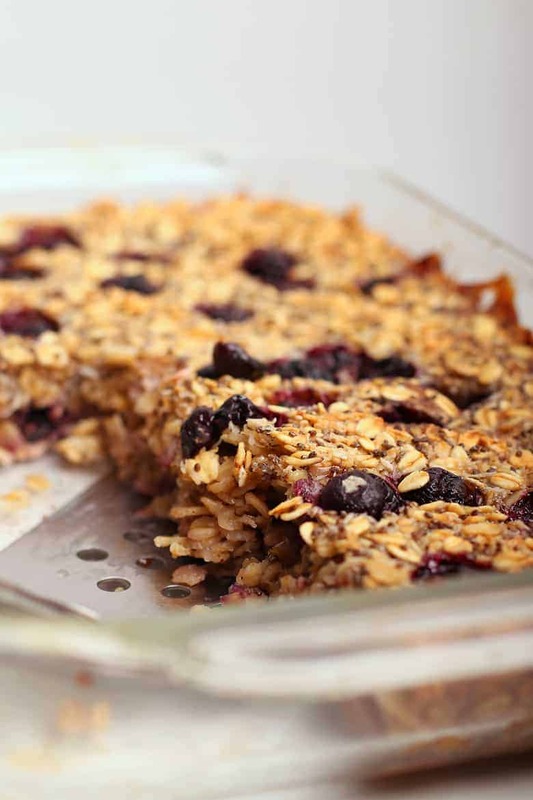 I love baked oatmeal, and this is my new favorite recipe! I thought it was plenty sweet without adding any extra maple syrup. Pecans on top are great too! I believe that would be fine! This looks fitting for my sweet-tooth. Thank you for sharing with such detail.